The ring has been a symbol of love and devotion for centuriesu. In recent years, however, more emphasis has been placed on buying the “perfect” engagement ring: not just a symbol of love, but a symbol of your love, personality, and relationship. Couples are seeking out custom designs and unique styles that reflect their individual tastes, making for more one-of-a-kind rings than ever before. This popular trend has lead to the rise of more unique diamond cuts and colors, including the pink heart cut diamond. Heart-shaped diamonds are particularly beautiful. Just look at the stunner Nicki Minaj sports or Lady Gaga’s ring from former fiance Taylor Kinney. Colored stones can enhance the elegance and whimsy of this unique shape. 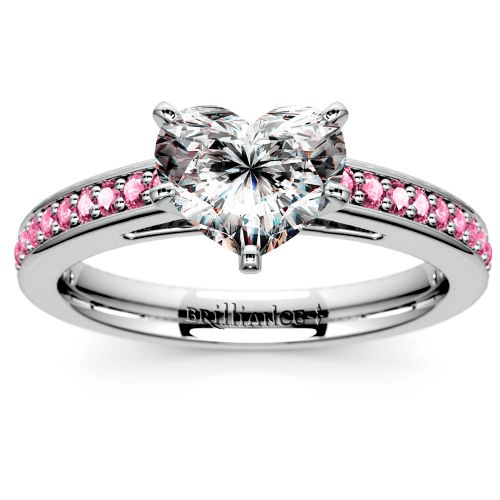 When you love a woman who is as ethereal as she is adorable, you can’t go wrong with a pink heart diamond. 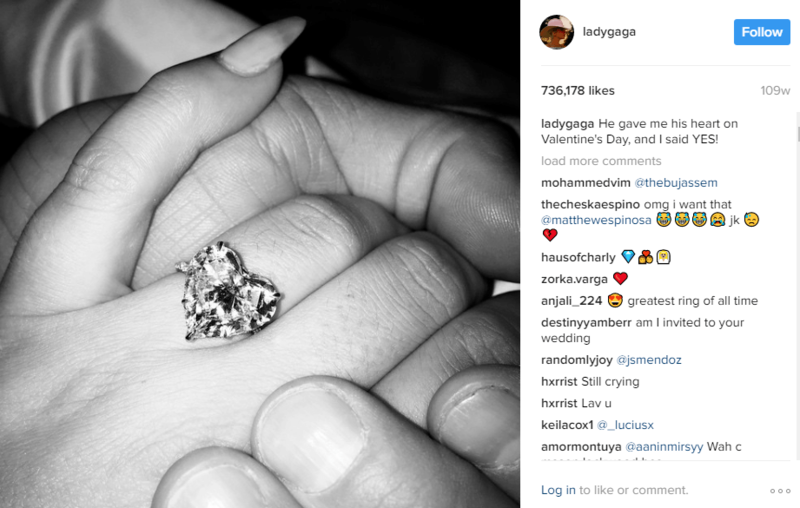 Lady Gaga’s stunning heart cut diamond engagement ring on her Instagram. Romantic, feminine and fancy, an engagement ring with a pink heart diamond is an unconventional choice, but for the right woman it is more than perfect. Pink diamonds symbolize femininity and creativity, but also resilience and endless affection, which makes this stone an excellent choice for the sweet bride-to-be that marches to a different beat. Proposing with a pink diamond ring is a very romantic gesture, one that any woman would adore. Pink diamonds are also considered a “fancy” color, and are very rare. They are so rare, in fact, that they are considered some of the most sought-after gemstones in the world (fun fact: most of the world’s natural supply is located in Western Australia). You can find pink diamonds in a variety of shades—from a pale blush to an intense, purplish-pink, and many hues in between. Of course, the rarity of pink diamonds does tend to make them more expensive. Because of this, some couples opt for a more budget-friendly option. One great example of this is the choice to use pink sapphires in lieu of a diamond. While pink diamonds represent romance, sapphires are traditionally linked to royalty. They can symbolize loyalty, trust, and good fortune. Like the diamonds, pink sapphires come in a wide range of stunning shades. 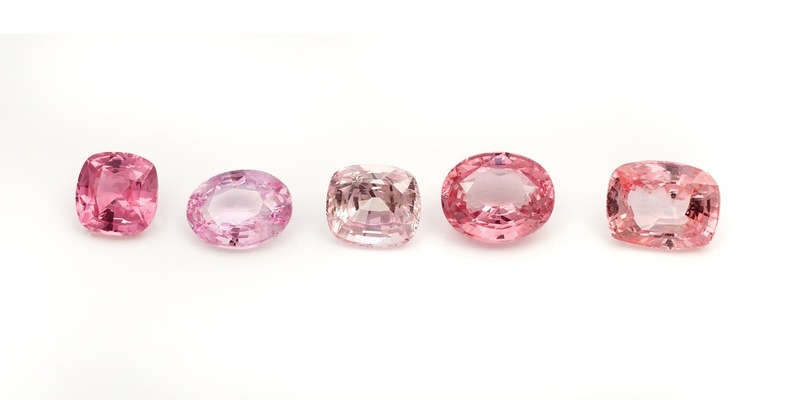 In fact, pink sapphires can offer deeper shades of pink, such as magenta or even almost-red shades. The shade of the stone will determine its price; the more vibrant the color, the more valuable it will be whether the stone is a diamond or a sapphire. Cut and clarity will also factor in, but on the whole, while pink sapphires are more common than pink diamonds, and thus more affordable. If your budget won’t allow for a pink diamond, opting for a heart shape diamond with pink sapphire side stones is the perfect compromise. 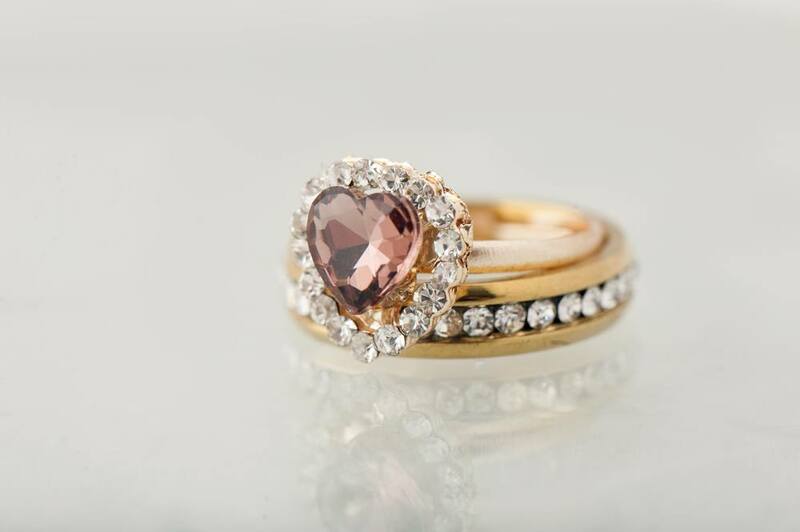 Whether you outfit your engagement right with a pink diamond or a pink sapphire, a heart-shaped cut is a beautiful way to highlight that gorgeous stone. So, when you have a fancy stone, why not try a fancy cut? Heart-shaped diamonds look breathtaking in nearly every setting. So whether you choose a solitaire, a halo, or a three-stone design, a pink heart diamond ring will be an unbelievable piece of jewelry that will turn heads in every room – perfect for the woman that captured your heart!